Julia Kathryn Vaulner, 73, passed away February 4, 2017. She was born February 21, 1943 in Saffell, Arkansas to Henry Oral Gray and Gladys (Sharp) Gray. 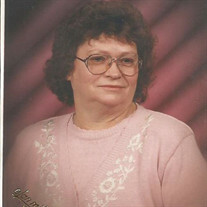 She was a member of Pleasant Valley Landmark Missionary Baptist Church. She loved to collect angels, read spiritual books, and talk and provide help to people. God called a special angel home who was loved by all her family, friends, and church members. The family of Mrs. Julia would like to thank every individual, church member, and people who brought food and offered to help out in any way. Mrs. Julia would want in her final wishes for anyone who is lost to be saved. She was preceded in death by her parents Henry Oral Gray and Gladys (Sharp) Gray, and her half-brother H.W. Gray. She is survived by her husband of 54 years Arvil Vaulner who would have celebrated their 55th Anniversary on June 10th, 2017. She is also survived by her son Charles O. Vaulner, two sisters, Lanoe Gray Dickerson and Jane Gray Holder, several nieces, nephews, and cousins. Visitation will be Wednesday February 8th from 12 PM - 2 PM with the funeral service beginning at 2 PM both at the Pleasant Valley Missionary Baptist Church with Bro. Patrick Trusty officiating. Pallbearers include: Ronald Coleman, Paul Don Carter, Darrel Snedker, Johnny Coles, Shane Wood, and Shelby Branscum. Honorary Pallbearers include: Sam Coles, Chandler Mathis, Charles Norris, Betty Gibbs, Danny Holder and Shane Sisk. The family would also like to give a special thanks to Arkansas Hospice and Amedisys Home Health for the compassionate care provided to Mrs. Julia.